There are few words in English more idiomatic than boatswain, also commonly written bosun and bo's'n (and pronounced bo-sun). A skilled officer of a ship, a boatswain could be described as the deck crew's foreman, responsible for the scheduling of tasks, calling men to order and inspecting that work done conforms to the standards required. 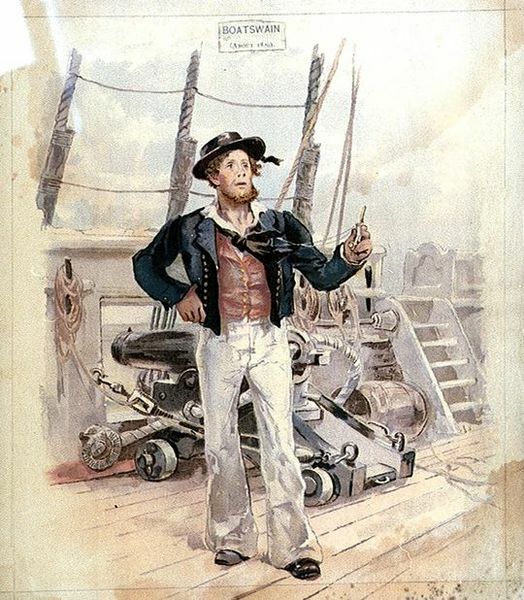 The boatswain, as well as being highly skilled in such areas as ropework (marlinspike seamanship) and ship maintenance, would also often captain firefighting and other emergency operations. 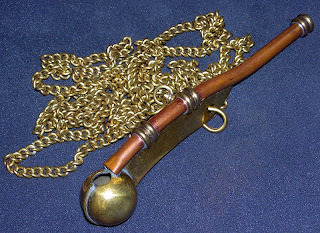 He would also ensure that commands were communicated throughout the crew by means of the boatswain's call, a high-pitched whistle that could be heard effectively even in the noisy and turbulent conditions at sea. In Dutch it's "bootsman". I wonder how and where "swain" transformed into "man" but as they both mean about the same thing, I guess it's just a literal translation, or something. Yeah, that'll be it. Not sure why I was so surprised about swain -> man. Anyhow, that's a very interesting looking whistle. Huh. Looks really cool. Without the description, I'm not sure I would've known what it was for, though. RYC: Thanks for the comment, Ed. And I think you might be right. It's an unusual etymology in that both 'boat' and 'swain' seem to have come from Old English first (or Norse) and then into Dutch. I tried to find out how 'boatswain' because pronounced as it is, but I couldn't find any information, so I think it must just have been an abbreviation through use. And it is an interesting whistle, isn't it? It and its sound are familiar from old sea films, but I think I would have thought it was some kind of smoking pipe if I were seeing it for the first time. Yeah! That's exactly what I thought the whistle was! A pipe!